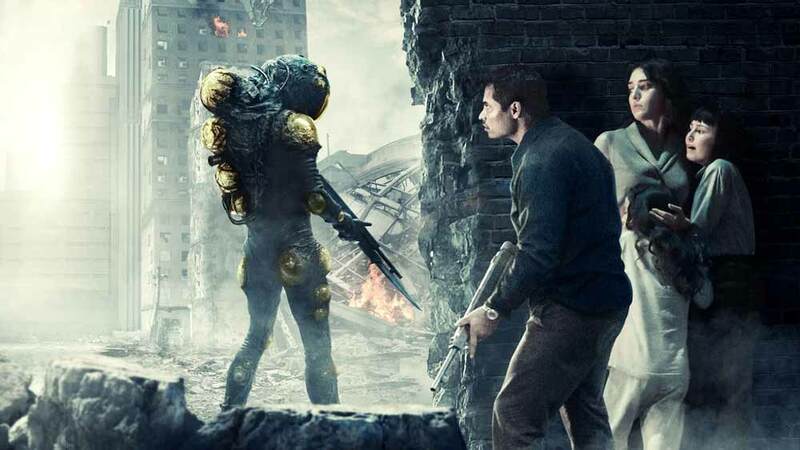 Extinction is Netflix’s brand new sci-fi thriller about a mass event that sees the world under attack from an alien force. The movie is quick moving, for the majority of the run time, and centers on Peter (Michael Pena) and the visions that he continues to have that are wreaking havoc on his life, his work, and his relationship with his wife, Alice (Lizzy Caplan), and their two daughters Hannah (Amelia Crouch) and Lucy (Erica Trembley). The visions center on the end of the world, and at first Peter is concerned about the re-occurring dreams that awake him at night, but once they start randomly happening during the day, Peter starts thinking that they are premonitions. As his wife pushes him to seek medical attention, Peter denies her request, believing more and more that what he is seeing in his visions are glimpses into a terrible future. Before they can debate further an attack reigns down on the luxurious apartment building, proving Peter right, but also thrusting him, his family, friends, and neighbors into a fight for their life as aliens on ground, and in the air, continue their relentless assault. The movie attempts to work a clever twist, but with terrible acting, a horrible, mundane story, it has zero impact. Special effects and proven sci-fi cliches aren’t enough to make this film the least bit entertaining, and you’ll soon be in a battle of your own, one to stay committed to seeing the film through until the end. The movie attempts to work a clever twist, but with terrible acting, a horrible, mundane story, it has zero impact. Special effects and proven sci-fi cliches aren't enough to make this film the least bit entertaining, and you'll soon be in a battle of your own, one to stay committed to seeing the film through until the end.